Having curly, somewhere between short and medium length hair I can’t really do a good hair flip but at some point today I am going to try it. I imagine I will look quite silly and hopefully no one will think I am having a seizure or something and call the paramedics. In the interest of made up holiday month I will take the risk though. So go on, flip your hair at some point today. Let me know what happens! And about the eleventh hour he went out, and found others standing idle, and saith unto them, Why stand ye here all the day idle? Or it may refer to when people had twelve hour work days and saved a particularly onerous task for the end of the work day, typically 5:00p to 6:00p. Today I say, feel free to wait until the eleventh hour to do something you really don’t want to do. Like make your A-Z blog post. Or work on your taxes. Or make a dental appointment. It is your life, go do something fun instead. Play on the swings, binge watch something on Netflix, make a pan of brownies instead of dinner. But only until the eleventh hour, whenever that may be for you. After all we are responsible adults and the yucky tasks must be done at some point, but for today waiting until the eleventh hour is okay. Expected even as I have just made it an official unofficial holiday! 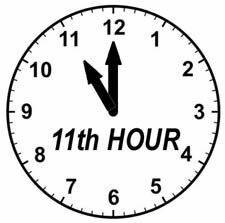 Let me know what your eleventh hour task was. Dyngus Day is a real holiday I learned about while living in Buffalo, NY. 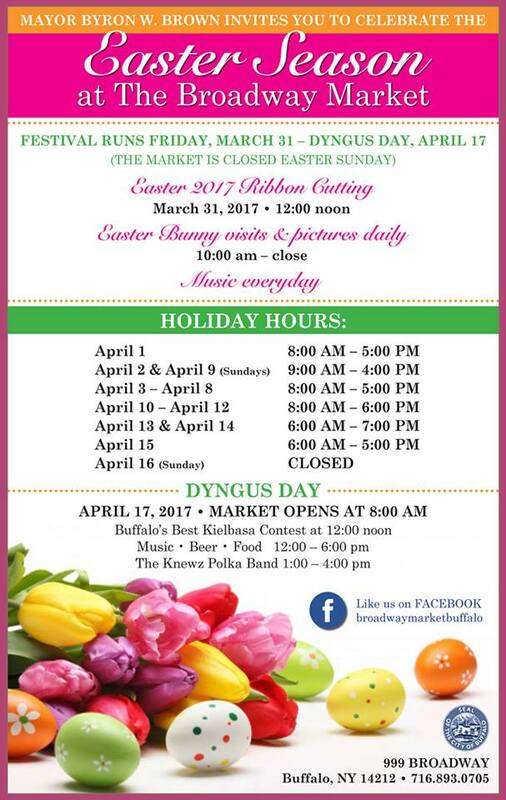 It is of Polish heritage and takes place on Easter Monday. Polka music, pierogis and a parade. The three P’s of fun! Want to learn more? Growing up in Baltimore we were always off school Good Friday and Easter Monday. Then I joined the Air Force and nobody had ever heard of Easter Monday. I like the idea of the day after Easter being a holiday. Who doesn’t need a day to work off (sleep off) all that sugar consumed on Sunday? It’s not too late to make travel plans to go to Buffalo, NY and celebrate in the Dyngus Day capital. Sure it may or may not still be snowing in mid-April there but trust me, no one can handle snow removal the way the city of Buffalo can! Dingus Day is April 17th this year. 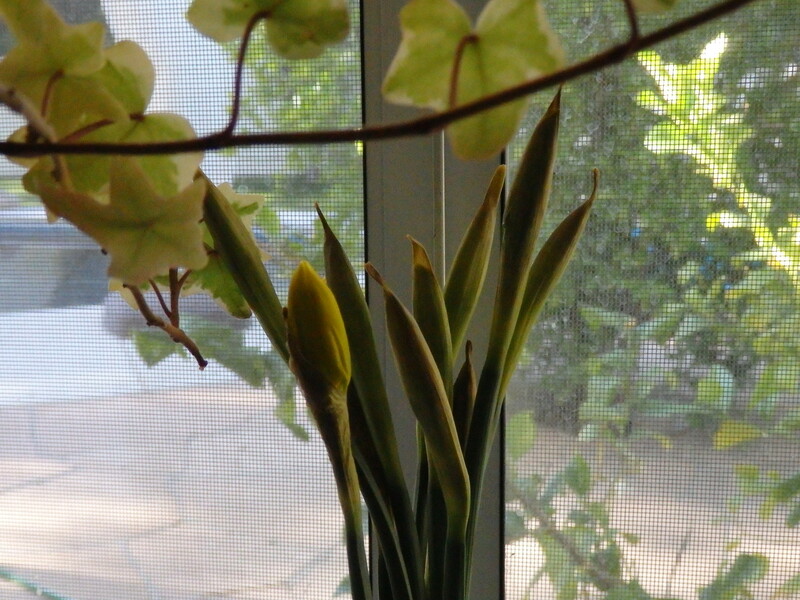 My Trader Joe’s Daffodil buds. How one is forced to do spring in the desert! That would be enjoy the picture on the calendar hanging on the wall. 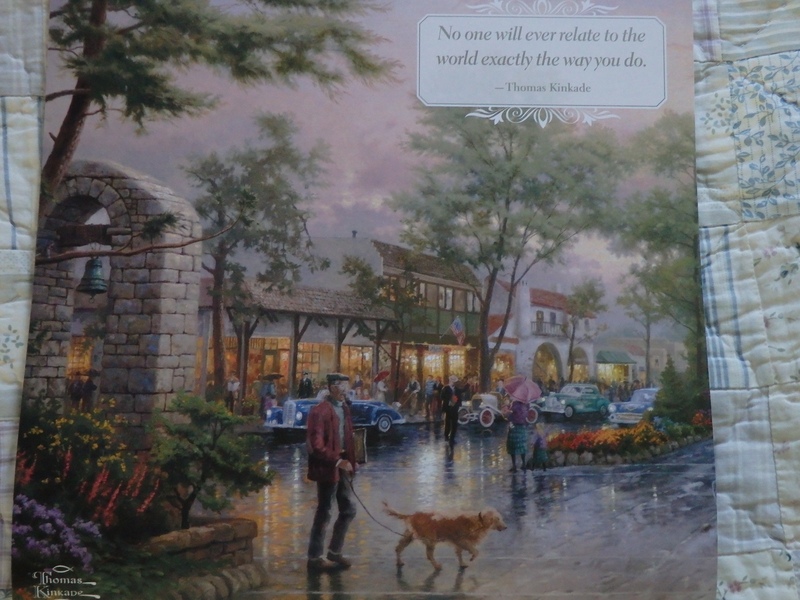 If you are like me you spent quite a bit of time looking through all the calendars at the kiosk at the mall last December. Agonizing over picking just the right one for the kitchen. Why does there always have to be one month where the picture is just not pleasing? One month that makes you hesitate and then look through all the calendars again. Of course you get the first one anyway telling yourself it will have to do. And of course it does do because you never really look at the pictures again. Except for today. Today you will look at the pictures and be glad you took such care in picking out this particular calendar. You will enjoy the colors and the composition and the feeling of joy such a wonderful picture brings. My office calendar and my favorite of the three. 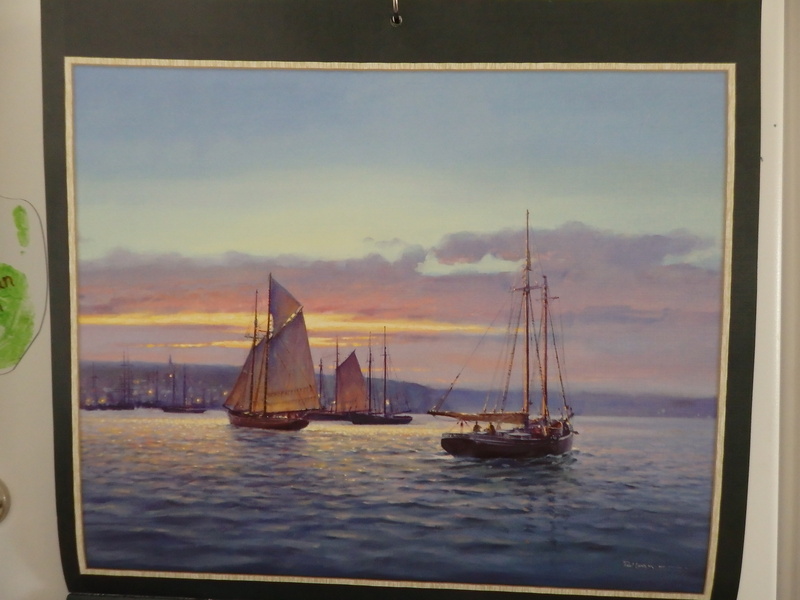 A local artist, Zinnia Sky Studio, I bought it at an arts and crafts festival last Thanksgiving. 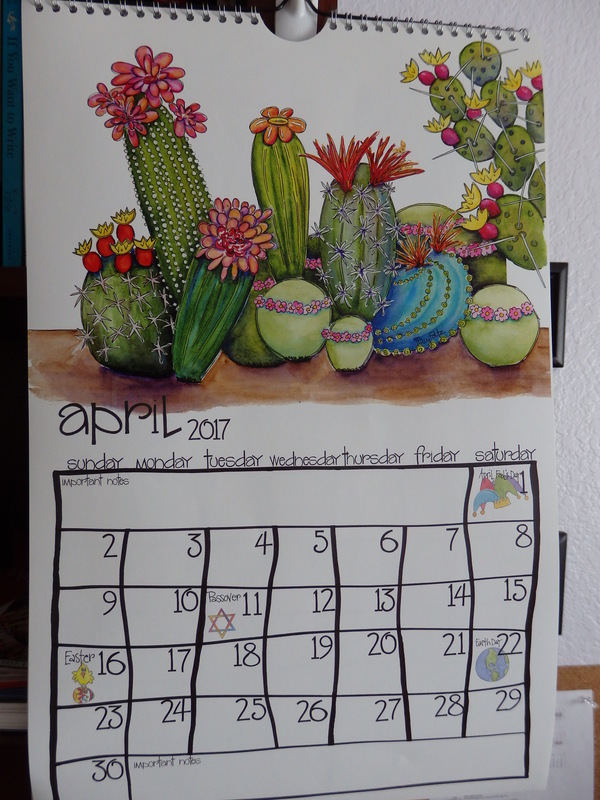 My bedroom calendar. I like something inspirational and peaceful. The kitchen calendar. I like something that reflects the seasons. This would be my least favorite month on this calendar! Drink your beet juice day doesn’t seem like a fun made up holiday. When I think of holidays I think of cake. But I suppose it would not be very mature of me to advocate a whole month of cake. One needs balance in life so let’s start the month off on a healthy note so we can have our cake later, guilt free! I have to confess I wasn’t sure if beet juice really existed. Sounds made up to me. Or like something you would see on a juice bar menu in California that hasn’t reached the rest of the country yet. But I was drinking a vegetable juice blend one day and saw beet juice on the ingredients list. Turns out beet juice is pretty healthy. And if you drink enough your pee will turn pink, how cool is that? So just for today add something healthy to your diet, something you would never think of trying, like Beet Juice! Hmm, apparently an Argyle day already exists! It may be harder to invent holidays than I thought. Looks like I am going to have to get very weird to be original. That is rather a scary thought. I have decided to stick with argyle sock day. I like it. And really the idea that spurred it was how boring most people’s socks are. When my son was a toddler it was easy to find cool socks, now it is much harder. I have always loved wearing interesting socks. Anything with a pattern or design or multi-colored. 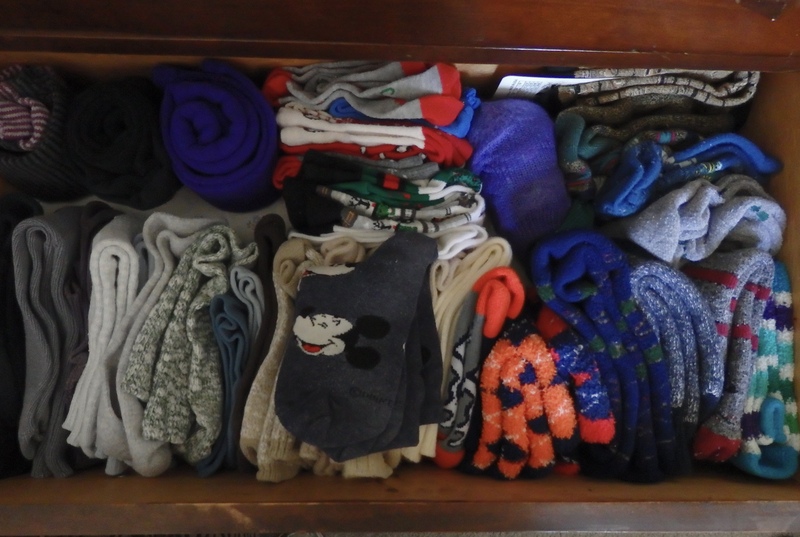 My sock drawer, see the argyle? So I say rise up and wear colorful socks today, argyle or otherwise. Keep feet interesting! Every year in March when we have a surfeit of oranges I start giving them away announcing that it is “Scurvy Prevention Day” as I hand them out. Some people actually believed this was a real day which totally cracked me up and I had to confess that I had made it up. This year I was thinking about how much fun it is to make up a holiday and that I should do it over the summer with my son. Anyone up for “Banana Splits for Breakfast Day”? The idea was also sparked by my “Our Country Diary” which I have used every year for the last 20+ years. This year their theme is celebrations and they have one interesting lesser known holiday listed in each week. For instance for 8 April they have “Sleep Late Saturday”. What a great holiday! I wish I had thought of it. So the plan is I am going to make up a holiday or on occasion use some of the more interesting and unusual ones I may stumble upon for the A to Z blogging challenge. Silly? Yes. But sleep late Saturday? I am all in. Z is for zero posts missed in the A to Z Blogging Challenge! Z is for zero posts left to do for the A to Z Blogging Challenge! My favorite post to write was “F is for Fiction from Fact” (and great alliteration in the title). What looked to be my most popular post was “I is for Introvert”. 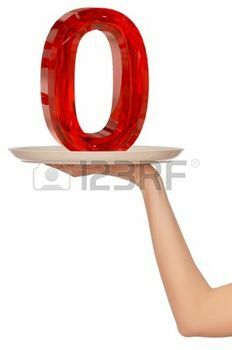 The post that I hoped would have the most impact was “L is for Lumpy Breasts”. I was hoping the catchy title would lure a few more readers. Hopefully it led at least one person to do a self-exam. After a short vacation (say a week to ten days) we will return to our regular posting schedule. Youtube – where you can learn to do a multitude of things. My personal examples include treadmill belt replacement, how to do the ladder stitch and how to darn a sock. Yawning – which thanks to my allergies I seem to be doing a lot of lately. Along with blinking due to very itchy eyes. 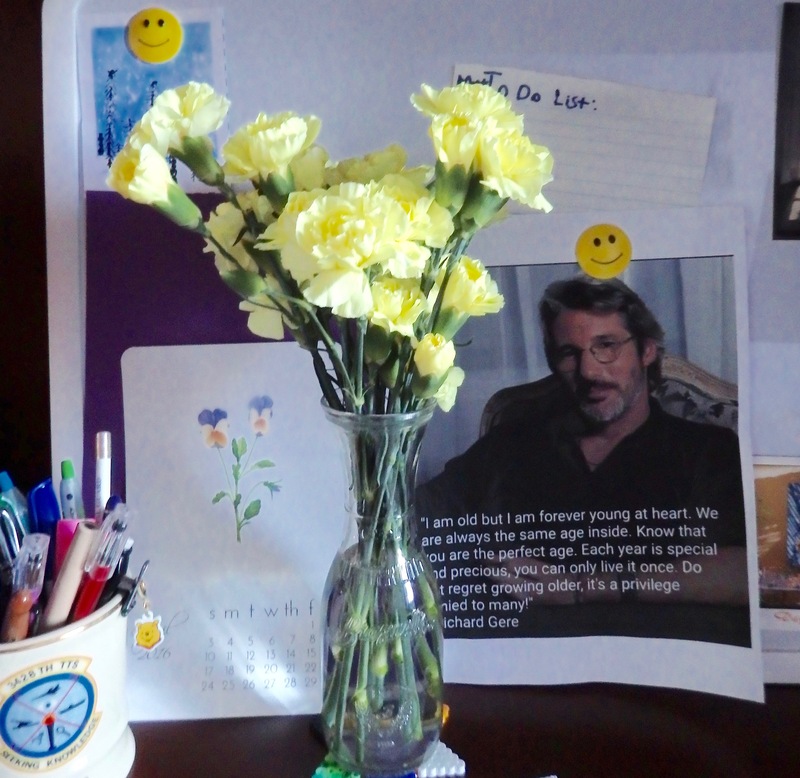 Yellow Carnations – a small treat for myself since I have been doing so well on the Whole30 and conquering the A to Z Blogging Challenge! As I kept staring at the empty ‘X’ space on the calendar I thought I would need to use the emergency back up plan. Besides x-ray did I even know any other ‘X’ words? And the word xylophone came to mind along with a memory. Sixth grade Christmas concert. Or was it fourth grade? So long ago, back when the word Christmas was still allowed in schools. I played the xylophone. I don’t even remember what songs we played. I just remember being up on the small stage plinking away. 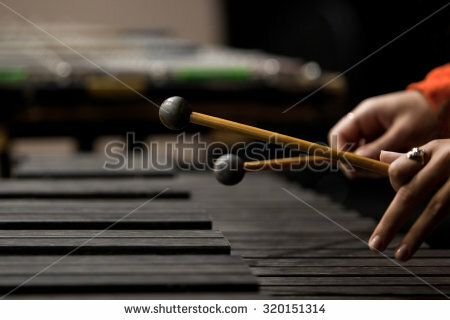 I love the sound a xylophone makes. How cool would it be to take up the xylophone now, at my age? I could finally learn to read music. It would be good for my brain and eye-hand coordination. It would be fun. I have never heard of a xylophone teacher or lessons but turns out there are lots of learning sites on line. Sounds like a great starting point. I think I will ask Santa for a xylophone this year.